Click here for a complete summary of results. See below for reports. Congratulations to the winners, Keyworth Allotments, and also to the organisers for another successful event! The 40th running of the Keyworth Quiz ended after seven weeks, twenty-seven quiz matches and over 1500 questions asked, with the Keyworth Allotments team beating the Keyworth Primary and Nursery School team in the first ever final to go to play-off questions and a sudden death final question to decide the winner. The thrilling finale was a suitable end to the evening after two extremely close semi finals. In the first semi-final, the Allotments beat the Friends fo Kadzinuni team by 63 - 59 and, in the second, reigning champions Willow Brook School were just beaten in the Bell and Buzzer round by the Keyworth Primary and Nursery School by 60 - 57. The semi-finals had included an innovative Pointless style round where the teams were tested on their knowledge of music, tennis, local shops and Prime Ministers to see who could guess the answer with the lowest score. The final was close all the way through. Keyworth Primary and Nursery School took a small lead into the Mini Mastermind round but the Allotments team showed their steel with two of their team scoring maximum points to give them a six point lead before the final Bell and Buzzer round. The school gradually caught up and equalled the scores on the final question to give a final score of 88 -88. Quiz Masters Paul Turner and John Spafford had prepared for this eventuality and asked five play off questions but the teams refused to be separated now drawing 92 - 92. The final question of the night was therefore asked - "Which item in the British Museum provided the key to translating Egyptian hieroglyphics?" The Allotments were quickest on their bell and captain Tim Coleman knew that the Rosetta Stone was the answer giving them their first ever Keyworth Quiz championship. Derek Oakley, who started the quiz back in 1976, proudly presented the trophy to the victorious Allotment team of Tim, Mary, Kate and Neil and wished the organisers well in the hope of keeping the quiz running for another forty years. 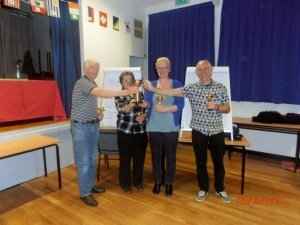 Monday 16th June was Quarter Final night at the Quiz. As you would expect there were some closely matched teams in contention to reach the last four and the matches all lived up to expectations with some of the highest scoring matches so far in the competition. Last year's finalists the U3A couldn't overcome the disadvantage of one poor scoring round about Famous Kisses as the Allotments won through. Willow Brook School and the Methodists was expected to be close and proved exactly that with the teams getting maximum points in their first round questions on Meryl Streep. Despite being behind going into the Bell and Buzzer round, Willow Brook had the mental stamina to win by 57-52. The Friends of Kadzinuni won three of their four rounds against the Parish Church, meaning that they, along with the Allotments, are two of the highest losing scorers from the first round to get to the semi-finals. The final match pitched the Tennis Club against the Keyworth Primary School and the School were the fastest of the two teams on the Bell and Buzzer round to take the fourth semi final place. Next week sees the Semi Finals and Final matches. Willow Brook are looking to do a treble but all the other teams will be looking to get their name on the Trophy for the first time. We are hoping for a large audience to come and enjoy what should be an entertaining evening. The first match saw the runners up from the previous two finals in opposition, the Dramatic Society and the U3A. On the day after Crufts ended, we had an entertaining round on Canine Friends to get the evening underway. In a close contest the U3A kept just ahead and won by 55-46. 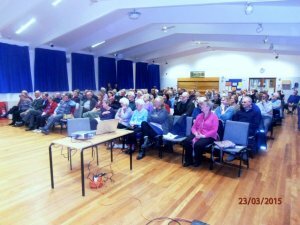 The Allotments and Local History Society were tested on their knowledge of the country's motorway service stations. The Allotments lead throughout and won by 48-36. Keyworth Primary School made their first appearance in the Quiz, having had a bye in the First Round. The school's knowledge of Myths and Legends gave them the edge and they won by 53-22. The final match saw the Friends of Kadzinuni win a very close match with the Rugby Club by 40-38, to line up a quarter final tie against the Parish Church. Thanks to Keyworth Guides for providing the refreshments this week. Next week sees the Quarter Final matches and there will be some competitive matches. Ninety people were in the audience in Week 4 which was the first of two weeks given over to Second Round matches. The first match was a tough encounter between recent winners the Methodist Church and BGS. With the scores tied at 25-all after the first three rounds, the match was decided in the bell and buzzer round by BGS incorrectly answering three questions after buzzing in too early – the Methodists running out 49-41 winners. The remaining three matches were all well won by the Tennis Club, the Parish Church and Willow Brook School. Next week sees the remaining Second Round matches with the Primary School making their first appearance after a First Round bye. Week 3 of the First Round matches proved to be another entertaining evening, starting with a high scoring match that saw the Dramatic Society beat the Allotments by 63 to 53. The Football Club on their comeback were outplayed by the Methodists, and the Guitar Club were too good for the Crossdale team. The South Wolds Students put up a good show, doing very well on the Mobile World but were out buzzed in the later rounds. The Allotments go through as highest losers with the South Wolds Staff and The Friends of Kadzinuni going through as second and third highest losers too. Week 2 of the First Round matches proved very entertaining, starting off with a brilliant match between BGS and the South Wolds Staff. After three rounds, the teams were level on 29 points and matched each other throughout the bell and buzzer round to draw 50-50. After the five play off questions, they were still level on 54-54 so a sudden death question had to be used. BGS were quickest to answer and so go through. With 50 points as a runner up, it also looks like the Staff will go through as one of the three highest losers. The sporting battle between the Rugby Club and Plumtree Cricket Club saw both teams living up to blokey stereotypes by scoring maximum points in a round about Breweries, but knowing hardly any of the second round questions on lyrics from musicals! The History Society and Friends of Kadzinuni also fought a close match with the Historians edging to victory in the bell and buzzer questions. The final match saw the winners from 2014, Willow Brook School, taking on the Olde Peculiars who had never progressed beyond the first round. The OP Captain, Godfrey Kent, had made a white flag that he waved at the start of the match, thinking the game was going to be completely one-sided, but the first round proved not to be so. A round on Numbers saw a well fought contest with the teams scoring eight points each. Unfortunately for the Peculiars, that was the high point and, after two difficult rounds, they trailed 43-16 before the bell and buzzer questions. During the final round, Godfrey questioned whether his bell was actually working, but the quiz master explained that he had to press it first for it to work. Willow Brook won by 81-22, which is one less for the OPs than their record low score of 23 in 2014. The audience look forward to their return for 2016. We now miss a week because of half term so the next quiz night is on Monday, 23rd February when the matches below take place. 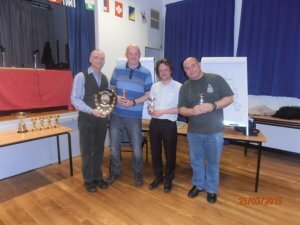 The Village Quiz started its 40th consecutive season on 26th January in the Village Hall. This year, the Quiz was opened by Alastair Allen who is one of the all time winners in the Quiz, with three victories for Crossdale School and one for the Scouts Turkey Trotters. Alastair praised the Quiz for bringing together so many of the organisations in Keyworth from the huge diversity of clubs, churches, societies and companies that make Keyworth such a pleasant place to live. As a quiz regular, he spoke of the enjoyment that the Quiz brings to the regular audience and team members. The opening three matches were fairly won by quite large margins, but the final match saw a storming comeback by the Tennis Club to pip the Scouts Parents by the smallest of margins. The night was a Scouts Jamboree with all three of their teams involved, and they also provided the team serving the refreshments – Quiz Badges all round! The Uniformed Branch beat the Turkey Trotters convincingly, doing particularly well on their individual questions in round 3. In the inter-denominational match, the Parish Church beat the Baptist Church who couldn't recover from a poor first round where they scored a duck. Probus also scored a duck in their first round against the losing finalists from 2014, the U3A, who's form looks ominous. The intervals on quiz nights are always a super time to catch up with folks you haven't seen for a while. Our refreshments were served by the Keyworth Cubs, helped by some of their parents. We miss a week because of the blood donors session on 2nd February, so the next quiz night is on Monday, 9th February when two of the most successful teams in Quiz history, The British Geological Survey and the Rugby Club, take part. The 2014 winners, Willow Brook School, are paired against The Olde Peculiars Golf Society who always provide an entertaining Quiz. Do come along and enjoy the entertainment, and bring a friend. At 7.30pm on Monday, 26th January, the 2015 Village Quiz will be starting in the Village Hall. Willow Brook School have won for the last two years, so who will step up to challenge them? The Keyworth Village Quiz is a unique event, as far as we know, in the UK, and this year is being run for the 40th time. Nearly all of last year's teams have entered, but contact the organisers if you want to take part as there may still be room to squeeze in a couple more. Teams of four compete against each other in a knockout competition over seven weeks until the final in March. Teams who enter don't have to be from a church, club or school – any four friends, or even members of a family, can enter, and thanks to your Parish Council, entry is absolutely free! To enter, or to find out more about the event, call John on 9374833, Paul on 9147804 or email to keyworthquiz@hotmail.co.uk. Details of the matches for the opening night will be on the Parish Council website. The closing date for entries is 7th January 2015, and the draw for the event will be held at the Village Hall on that evening at 7.00pm. All teams are welcome to attend the draw (if you get there early, you can even help make the draw). Best wishes for Christmas and the New Year to all our supporters. XHTML 1.0 validated. WCAG compliant. Page generated in 0.1556 seconds.